THOUGH MANY may be happy with the Government’s deal on the promissory notes simply because it allows the final death of IBRC – the former Anglo Irish Bank, an institution few will mourn – most people will simply wonder how the deal impacts on future budgets. Well, the news is that the deal won’t make much of an impact on this year’s Budget – that is, the taxes and spending in place for 2013 – but it will ease the burden quite a bit in the Budget coming this December, for 2014. The graphic you’ll see below (which you can see in full here, if you need a larger version) is from the Department of Finance’s technical briefing this evening, and shows the effect for this year’s Budget and for the next two. The ‘GGB’ figure are the very top line is the deficit the government currently expects to run (that is, without introducing any new policies and simply leaving the law as it is for another year). These figures were most recently updated in the documents accompanying Budget 2013. Underneath that is a list of the impact caused by each measure. 1: This is simply the amount we save by not having to pay annual interest on the promissory notes any more. Of the €3.06 billion that was due to be repaid next month, €1.875 billion was interest. This is no longer being paid. 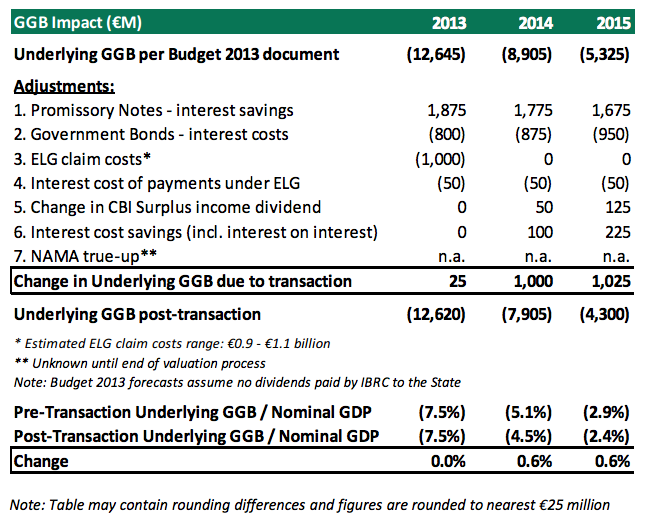 2: This is the cost that Ireland will instead incur by issuing a batch of government bonds. These will carry annual costs, as indicated, which are significantly lower than those attached to the promissory note. 3: This is the amount the Government expects to have to pay under its various bank guarantees, refunding those who may have had deposits in IBRC and who will now be burned, and so on. As the graphic indicates, the government reckons this is somewhere between €0.9 and €1.1 billion. 4: This is simply the interest the government will face as a result of point 3. 5: This refers to the increase in the amount that the Central Bank will pay to the government as a result of its increased profits. Though the institution is independent, its profits are returned to the Exchequer at the end of the year. Figure 5 shows the impact of this. 6: This is the amount that the government saves in administration by not having to pull together the payments listed under heading 1. 7: This is the only one still up in the air – it’s the amount that the Minister for Finance might need to pull together to give to NAMA, if it can’t find buyers who will pay a fair value for IBRC’s old assets. It’s simply not known whether any such costs will be incurred, or (if they will) how much they might be. The end result is what you see at the bottom – the effect for 2013 is negligible, but for 2014 and 2015 the Budget changes can now be €1 billion softer. Unti today, Budget 2014 was required to find adjustments of €3.1 billion – with €2.0 billion in spending cuts and €1.1 billion in tax increases. This adjustment could now be significantly watered down without hampering Ireland’s ability to meet its deficit targets. Similarly, the adjustments for Budget 2015 were to include €1.3 billion in spending cuts and another €700 million in taxes. This adjustment could be almost halved and the targets could still be met.